In the world of puzzles, there are certain images that are unmistakable, no matter what language you speak. A few concepts that are universally familiar and instantly recognizable. A Scrabble tile. The black and white pattern of a crossword grid. The Rubik’s Cube is iconic, and it feels like part of the fabric of puzzles at this point. We’ve seen people set new records in speed-solving them, computers designed to solve them, and foods crafted to look like them. There have been Rubik’s Cube Halloween costumes, marriage proposals, and art installations. People are even designing and 3-D printing their own Rubik’s-inspired creations. But no one has ever brought the Rubik’s Cube to life quite like Bastiaan Schravendeel and the team at Polder Animation. In the short animated film Scrambled, we’re introduced to two unforgettable characters on a train platform: a girl named Esra and a nameless Rubik’s cube. When Esra misses her train and busies herself with her phone while waiting for the next one, the perceptive little Rubik’s Cube makes its presence known. I could talk about all the messages and subtext underpinning this wonderful little story: analog play vs. digital, the value of feeling a well-earned sense of accomplishment, the magic of puzzles. You no doubt detected the same themes while you watched the short. But instead, I’d rather give a shout-out to the wonderful animators who brought this world to life. 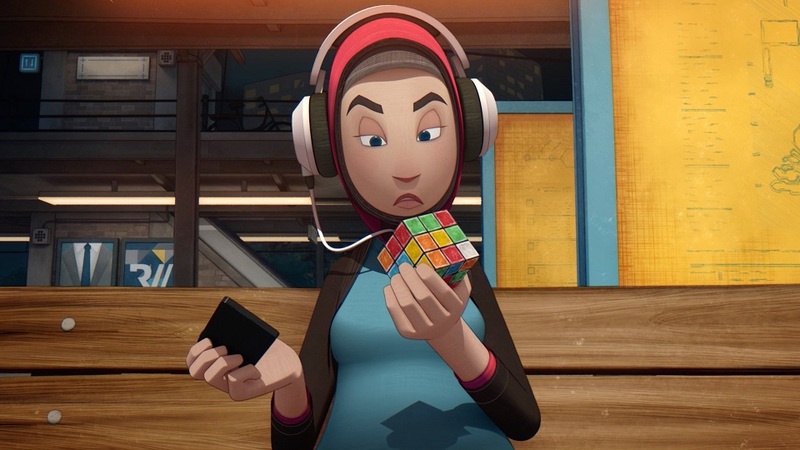 Esra is instantly relatable, shutting out the world for a bit while waiting for her train, and the hilarious, puppy-like antics of the Rubik’s Cube are immensely engaging. You can’t help but root for the little guy, even if solving him seems to bring an end to his interactions with Esra. It’s amazing how quickly you forge a bond with the Rubik’s Cube, and the animators deserve high praise for making a puzzle that inspires wonder and frustration in equal measure into one so endearing. The biggest challenge was to create a genuinely believable, likable and relatable character from a Rubik’s cube without making it about anything other than it being a Rubik’s cube. I’ve always liked films that manage to evoke emotion and personality from objects that usually don’t have any, especially if it can be done without dialogue. Dialogue would have ruined the simplicity and wonder of Esra and the Cube’s interactions, and the mix of wordless communication and physical comedy made for a wonderful viewing experience. Scrambled is a delight. I hope you enjoy.